Ph.D. candidate Chris Bolden has received the prestigious Southern Regional Education Board (SREB) fellowship for doctoral students. The fellowship is specifically for minority Ph.D. candidates who want to pursue careers in education. It will include financial assistance, research funding, attendance at the Institute on Teaching and Mentoring in October in Atlanta, career mentoring, and assistance finding postdoc positions specifically for teaching. May. 30, 2018 | May 30, 2018 | Ever since Ph.D. candidate Chris Bolden can remember, he’s been fascinated by how small changes can have big impacts in the biological world. Today, he studies how he can harness for positive purposes one of the basic functions of viruses, using them to deliver antibodies into cells that work against methamphetamine addiction. In the past few years, he has grown to love how similar effects can occur in education. One specific approach, analogy or teaching method could make all the difference for a particular student. 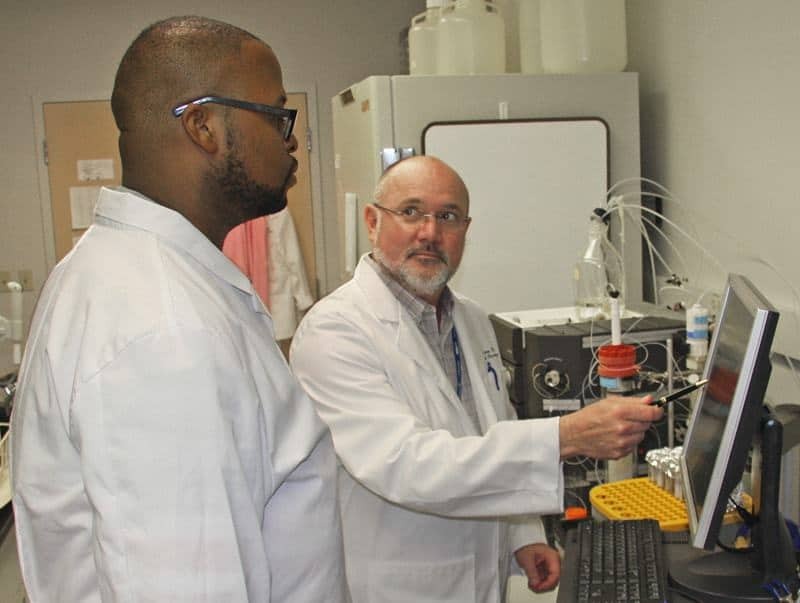 Bolden works in the lab of Eric Peterson, Ph.D., right, in the Department of Pharmacology and Toxicology. “I love it when a student tells me, ‘I see what you’re getting at,’ or you can literally see it in their face when they have that ‘ah-ha’ moment – it makes you feel like you’re actually getting through to them,” Bolden said. In both microbiology and education, small changes can make big differences, and Bolden has decided to continue exploring both by going into academia. He also knows that one of the ways in which he might be the right person to connect with a student is because of his race. He can only remember having one African-American male professor during his undergraduate science education, and he wants to be part of changing that. While working toward this goal, Bolden applied for and has received the Southern Regional Education Board (SREB) fellowship for doctoral students. He begins the one-year fellowship in July 2018 and it is renewable for two years. It is specifically for minority Ph.D. candidates who want to pursue careers in education. It will include financial assistance, research funding, attendance at the Institute on Teaching and Mentoring in October in Atlanta, career mentoring, and assistance finding postdoc positions specifically for teaching. Bolden, far left, is also part of the Graduate School’s Initiative for Maximizing Student Development, which aims to increase the number of students graduating with doctorates in biomedical sciences who come from underrepresented groups. He will network, be exposed to teaching opportunities, have assistance with logistical hurdles and generally have a group of people who are invested in helping him advance his career goals – a combination of support and accountability. “It’s a little like having extra parents, but for your career,” Bolden said. The SREB’s goal is for there to be more minority Ph.D. students who seek careers as faculty on college campuses. They note that while more than one-third of America’s college students are people of color, those numbers are not reflected in college faculty, where about 5 percent are African-American, 3 percent are Hispanic and 1 percent are Native American. Since it began in 1993, the SREB has supported about 1,200 students at 94 institutions in 31 states. 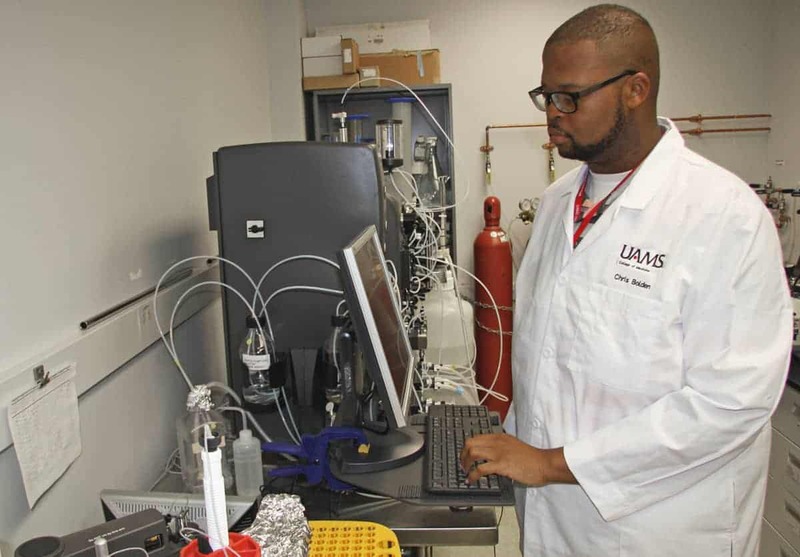 At UAMS, Bolden is in the Graduate School’s Interdisciplinary Biomedical Sciences program. He is working in the Department of Pharmacology and Toxicology in the College of Medicine in the lab of Eric Peterson, Ph.D.
“When Chris first came to my lab, he immediately impressed me with his drive and his scientific curiosity, and since then he has continued to impress me with his ability to network professionally and find opportunities and sources of funding, like this SREB fellowship, which is instrumental to any successful career in the academic sciences,” Peterson said. He is also a member of the Graduate School’s Initiative for Maximizing Student Development, which aims to increase the number of students graduating with doctorates in biomedical sciences who come from underrepresented groups. It is funded by a grant from the National Institute of General Medical Sciences and provides participants with tuition, fees and a $24,000 annual salary for their first two years of graduate study. It also includes training, networking and mentoring opportunities. “We’re very proud of Chris for everything he’s accomplished so far and for receiving this prestigious fellowship. We know the selection committee saw in him what we already know – that he is going to be a great science-educator and his future is worth investing in,” said Robert E. McGehee Jr., Ph.D., dean of the UAMS Graduate School.